Fastest in its class! 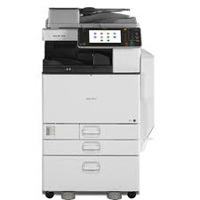 The new Ricoh Aficio MP C6003SP is in a class of its own. For the first time a 60 page per minute full colour compact A3 model is available with no equivalent offerings in alternative manufacturers ranges. The new MPC6003SP is the tope of the range model based on the same engine with speeds working through a range from 30 to 60 ppm. Built to compete directly with the high quality of the Konica Minolta Bizhub range this new high speed product offers amazing colour qulaity with true media flexibility feeding SR-A3 and printing an ovesize image and accpeting media weight up to 300gsm for business cards and presentation covers.